Native Pennsylvanian Don Everhart has produced a remarkable 81 winning coin designs and sculpts and 29 medal designs and sculpts in the 10 years he has worked for the United States Mint. Everhart earned a Bachelor of Fine Arts in painting from Kutztown State University in 1972. The following year, he joined the Franklin Mint as a designer and attained the position of staff sculptor, which he held for five years. In March 1980, Everhart left the Franklin Mint to pursue a freelance career. During this period, his projects included work with figurines, plates, coins and medals. His clientele included prominent companies such as Walt Disney and Tiffany and international mints such as the Royal Norwegian and British Royal Mints. Everhart has received numerous commissions, most notably Georgetown University’s Sports Hall of Fame, a 24-piece bronze installation. Everhart’s work has been exhibited internationally and is included in several permanent collections, including the Smithsonian Institution, the British Museum, the American Numismatic Society and the National Sculpture Society. He also received the prestigious American Numismatic Association’s Sculptor of the Year Award in 1994. In 1997, his submission was chosen as the official inaugural medal for President Clinton’s second term. 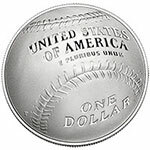 Of all the coins you have designed for the Mint, which is your favorite? I liked the fact that the horses were in action. Also the sagebrush framing the composition worked well for me. In addition, the banner with “The Silver State” across it tied everything together. The front horse jumping over the banner gave the design immediacy and more impact. Of all the medals you’ve designed, what’s your favorite? 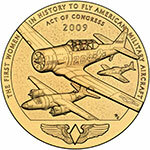 My favorite medal design is the Women Air Force Service Pilots Congressional Gold Medal reverse showing the planes the WASPs flew during the Second World War. The Women Air Force Service Pilots mostly flew three planes, the P-51, the AT6, and the B-26. I wanted to incorporate all three into the design with a nice interaction and negative space between them. In addition, I had to work out the text on the border so that it was integrated into the design and at the same level left to right at the beginning and end of the phrase. That took a lot of trial and error work until I was satisfied with the configuration. What’s has been your favorite coin series to work on? My favorite coin series has been the $1 Presidential. I have always had an affinity for portraits and this series was ideal in that respect. These men had a lot of character in their faces and I wanted to somehow show some of their personality in my renditions. I designed the common reverse and have designed 14 of the obverse portraits. My outside the Mint interests include my family and two young grandsons. I also enjoy music and cycling. What’s the biggest change you’ve see at the Mint since you started working here? I think the biggest change I’ve seen since I started working here in 2004 has been the conversion from analogue to digital in the coin manufacturing process. When I started at the Mint we were still using the Janvier machines to reduce models to master hubs. Now that process has been eliminated, and we use cameras and computers to get to the master hub. The digital process has also been a big help and timesaver when it comes to doing revisions on artwork before the reduction process. 2014 Coins: Baseball Hall of Fame obverse (sculpt) and reverse (design and sculpt); Great Sand Dunes America the Beautiful quarter; First Spouse Gold Coin—Florence Harding reverse (sculpt); US Marshals Gold reverse (sculpt). 2015 Coins: March of Dimes Commemorative Coin (design and sculpt); Harry Truman Presidential $1 Coin (design and sculpt); John F. Kennedy Presidential $1 Coin (design and sculpt). 2016 Coins: Richard M. Nixon Presidential $1 Coin (design and sculpt). 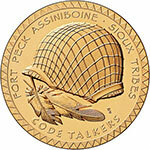 Code Talkers Congressional Gold Medals: Fort Peck Assiniboine obverse (design and sculpt); Ho-Chunk reverse (design and sculpt); Oglala Sioux reverse (design); Yankton Sioux obverse (sculpt); Crow obverse and reverse (designs); Hopi reverse (sculpt); Cheyenne River Sioux reverse (design); Choctaw reverse (design); Osage reverse (design); Pawnee reverse (design); Sisseton reverse (design). Additional Congressional Gold Medals: First Special Services Force reverse (sculpt); Raoul Wallenberg (design and sculpt); Shimon Peres obverse (design and sculpt).